Murter-Apartments.co.uk offers you the largest list of private accommodations in Murter available on the internet, a rich photogallery and much more. Find apartments, villas with pool, studio-apartments, from cheap rooms to luxury apartment with no reservation cost. Check out guest reviews and ratings, and have a best vacation in Murter. Cheap Apartment, internet connection, recommended by travellers ! town of Murter price per day from € 40 Apartment is situated in an exclusive position near the sea in one of the most famous seaside resorts in Dalmatia - Murter. In this comfortable accommodation equipped with stylish furniture, you'll be able to relax with a gorgeous view of the sea. Distance to the shopping center: 550 m. Distance to the beach: 400 m. Distance to the restaurant: 500 m. General details: barbecue, parking, outdoor shower. Accommodation near the beach, 122 square meters town of Murter price per day from € 78 If you are fancy about ideal holiday retreat and enjoyable accommodation then you should choose this apartment. Modern apartment is located only 530 m from the beach. Entertainment and Outdoor activities: outdoor grill, Satellite television. Distance to the restaurant: 500 m. Distance to the marketplace: 560 m. Distance to the beach: 530 m.
Holiday apartment, close to the beach town of Murter price per day from € 57 Pleasant apartment in the popular summer location on the Croatian coast - Murter, provide you with everything you need for a memorable holiday break: pleasant interiors furnished with modern furniture, full of light and vibrant colors, sea view, proximity of the beach, a number of amenities and an enjoyable atmosphere. Distance to the shopping center: 800 m. Distance to the beach: 600 m. Distance to the restaurant: 280 m. General details: barbecue, parking. 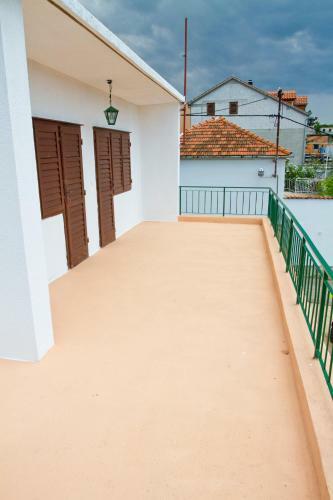 Apartment, 85 square meters, 47 eur per day town of Murter price per day from € 47 Spend your summer holiday in a lovely house on the Croatian coastline in this private apartment that is located just 780 m from the attractive beach. Kitchen information: fridge, microwave, stove. Distance to the marketplace: 160 m. Distance to the restaurant: 50 m. Distance to the beach: 780 m.
Cheap accommodation, close to the center of town town of Murter price per day from € 70 Throughout your visit to Croatia, don't forget to check out the city of Murter, which will surprise you with its numerous cultural and historical attractions. While there, book this perfect accommodation that overlooks the city and exquisite Adriatic Sea and relax in its comfortable rooms equipped with all required amenities. Distance to the beach: 220 m. Distance to the marketplace: 200 m. Distance to the restaurant: 900 m.
Air-conditioned accommodation, close to the beach, Murter town of Murter All you need for a perfect holiday, you will find in the high-quality accommodation which is located in one of the most stunning cities in Dalmatia - Murter. Entertainment and Sport: TV, Satellite television. General details: air conditioner, fitness, sauna, garden, terrace, balcony, barbecue, parking. Apartment, 23 eur per day town of Murter price per day from € 23 Apartment, 23 eur per day. Distance to the marketplace: 100 m. Distance to the beach: 20 m. Distance to the restaurant: 80 m.
B&B The Radej Retreat town of Murter Featuring gratis wireless internet and a grill, B&B The Radej Oasis presents accommodation in Murter, 41 km from Zadar. Certain rooms feature a seating area for your convenience. This bed-and-breakfast has a private beach area and mountain bike rent is available. You can engage in various adventures, for instance scuba diving and diving. Šibenik is 28 km from B&B The Radej Retreat, while Vodice is 19 kilometers away. The closest flight terminal is Zadar Airport, 33 km from B&B The Radej Retreat. Camp Dalmacija town of Murter Featuring its own private beach, Camp Dalmacija is set 2.5 km from the centre of the tiny fisherman's settlement of Tisno. A dining establishment serving local and international specialties is located on site. The famous sandy Slanica beach can be reached in a 10-minute drive. All mobile homes feature air-conditioning and a well-equipped kitchenette with a dining area. an outdoors terrace with a seating area that rises above the sea is available in each unit, as well as free internet access and free car parking. A grocery shop can be found just a couple of steps away, while the centre is 2.5 kilometers away and presents a church and a market. Murter-Apartments.co.uk has a wide range of Murter accommodation at great rates to enable you to enjoy all the amazing and sunny city has to offer. The town of Murter is situated close to many national parks and attractive tourist resorts. Murter-Apartments.co.uk - the definitive guide to Murter apartments. Murter, Croatia is the oldest village on the island by the same name, dating back to the Roman times, as testified by the remains of the Roman settlement Colentum at Gradina hill. Murter has road connections with the Adriatic tourist freeway through the town of Tisno, and it is 30 km from Sibenik. Numerous accommodation facilities (villas, rest houses, apartments, villas) and good connections make Murter one of the most frequently visited destinations in this part of the coast. 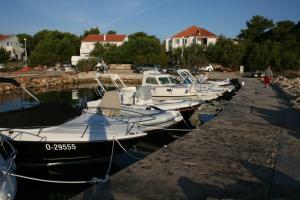 Marina, located in the cove of Murter, has 350 berths in the sea, and 170 berths on the land and a full infrastructure. Countless restaurants and taverns, sports courts, various water sports, and cultural and entertainment events are all reasons to spend your summer on the island of Murter. Murter Kornati regatta held in April. Amateur Drama Festival held in May. Colentum, remains of the ancient Roman town. Traditional cultural event St. Rocco held in August. Traditional Dalmatian regatta "Latinsko idro". Slanica beach, small sandy beach. Kosirina beach, rocky and sandy beach. Beach Podvrske, suitable for fishing and jumping into the sea. Beach Luke, city beach of Murter. Suitable for children and older people with concrete terrace for sunbathing.